We are all like roses in a way. 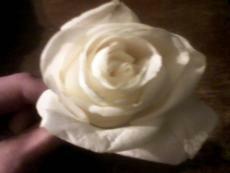 Roses aren't perfect(the thorns) just like us, but in the end, we end up being something special that God created! We are like roses and in the end we need to realize no one is perfect and see each other as a valuable gift. We all have "thorns" in our life. ON THE DOOR WAITING FOR. THE SUNSHINE OF YOUR LOVE STREAMS IN! IS THERE MUCH MORE LORD? This page was created in 0.3971 seconds.